The Lost Child. The lost child is usually a younger child who withdraws into a world of fantasy, music, video games, or the Internet, seeking security in solitude. Their relationships and social skills may necessarily suffer. The Mascot. Also a younger or youngest child, the mascot manages fear and insecurity by being cute, funny, or coquettish to relieve family tension. Although these roles help children cope growing up, as adults, they often become fixed personality styles that prevent full development and expression of the self. Roles prevent authentic communication necessary for intimacy. As adults, deviating from a role can feel as threatening as it would have been in childhood, but it’s necessary for full recovery from codependency. Roles can also conceal undiagnosed depression and anxiety. Often, the depression is chronic and low-grade, called dysthymia. Many develop trauma symptoms of PTSD – post-traumatic stress syndrome, with painful memories and flashbacks similar to a war veteran. Physical health may be impacted as well. The ACE (“Adverse Childhood Experiences”) study found a direct correlation between adult symptoms of negative health and childhood trauma. 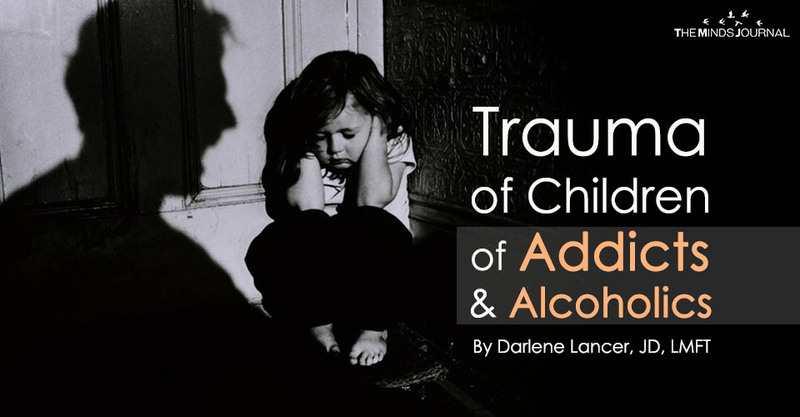 ACE incidents that they measured included divorce, various forms of abuse, neglect, and also living with an addict or substance abuse in the family. Children of addicts and alcoholics usually experience multiple ACEs. Lisa Frederiksen, daughter of an alcoholic mom, coined the term “Second-Hand Drinking” or SHD to refer to the negative impact an alcoholic has on other people in the form of “toxic stress.” It’s toxic because it’s unrelenting and children can’t escape it. In her own recovery, she made the connection between ACEs and SHD and how toxic stress can result in generational addiction, including her own struggle with an eating disorder. “During our conversations, mom identified herself as having five ACEs and that her own mom (my grandmother) had a drinking problem…All of us had long-term exposure to secondhand drinking. To be clear – not all ACEs are related to SHD, of course. My mom had two and I had one of those, as well. “Mom and I talked about my realization that I’d blindly participated in passing along the consequences of my own untreated SHD-related ACEs to my daughters the same way my mom had blindly passed hers to me. And these consequences were not limited to developing alcoholism or an alcohol use disorder. They were the consequences of insecurity, anxiety, fear, anger, self-judgment, unclear boundaries, accommodating the unacceptable, constant worry, and the other physical, emotional and quality-of-life consequences of toxic stress. It was this shocking insight that moved me to treat my untreated SHD-related ACEs and help my daughters treat theirs.